Our Company is urgently looking for Driver with minimum of 1 Year Experience in UAE. -Must be familiar with roads of United Arab Emirates. Salary Negotiable depends on the position and experience. Candidates have to join Immediately.. If you are interested Contact on below provided Mobile number or send your CV to below provided E-mail. If you have the skills and experience which is required for Light Driver position, please forward your resume to below Email Address, or through given Contact numbers, Shortlisted Candidates will receive confirmation email. 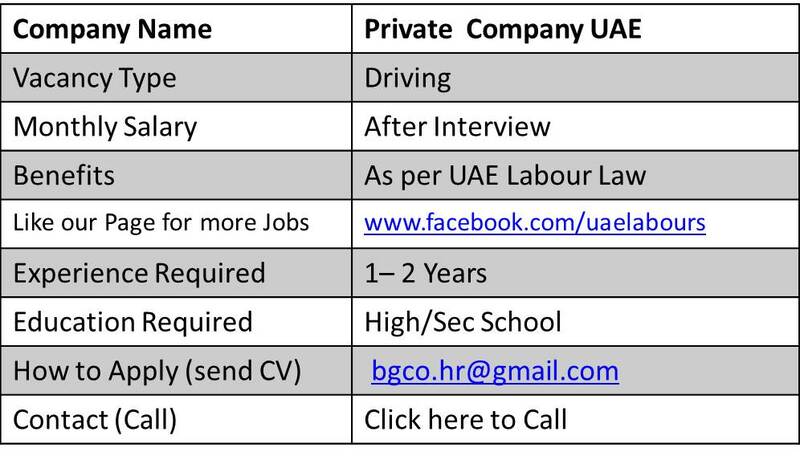 Find Jobs in Pakistan, UAE,Saudi Arab countries. Thousands of Jobs Currently available and more being added Everyday.